It all started with a card kit I was packing. It was mostly in the shades of GREEN. I also recalled that I saw something about St. Patrick's Day and the light bulb appeared above my head. Ting! 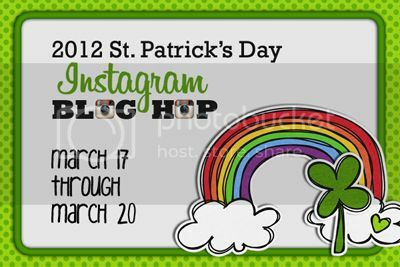 Immediately, grabbed my iPhone and loaded the tweegram with the intention to ask my fellow instagrammers if they would be interested to do a St. Patrick's Blog Hop "the instagram" way by doing GREEN giveaway(s)/ RAK(s). Lo and behold, guess what... within 2 days I got overwhelming response from my fellow buddies @ the Instagram. How awesome eh?! I just love this community & pretty addicted to it too if you ask me. Lol. Did you notice that our photos are also the Instagram way?! Cool eh? 1. Be a follower (to make sure you get to check back if you are the winner). Thanks for coming up with the blog hop idea. I'm having fun hopping around this morning :-) It's great to make some new Instagram friends. Thank you so much for pulling all this together and it is such a great way to share IG and totally love those ideas of giveaway RAK! Wowwwwwwwwwww!! What great giveaways!! Great hop!! I love Instagram. I just need to print out some of the photos!! I love this giveaway :) and thank you for bringing us all together its been great! Hope you are enjoying the hop! A beautiful share today. I am having so much fun during the GREEN blog hop. You have some delightful green items in your giveaway. Fun, fun fun. Thank you for the wonderful opportunity. I am your newest follower and can't wait to see what you share next. OOOOOoh your bracelet prize is gorgeous. Fingers crossed. And thanks for creating this hop it has been to much fun connecting with my favorite bloggers through this app. Great prizes!! Thanks for a chance to win! thanks for holding this Jess! what a great idea and generous giveaway! Ooo - I love your give-a-away! So much good stuff :) So glad I happened upon your blog! and thanks for the chance to win your prices. love you, Jes! Jessy, very interesting group of ladies. Thanks for organizing this international event. Love that green bracelet! Super cute! Love that bracelet! This is fun. Thanks for the chance! First of all thx a million for getting us all together, I've loved meeting so many inspirational ppl, although we're miles apart we all have so much in common! I've had lots of ppl stopping by, I've loved all the comments and seen some ace blogs! Catch up soon, thx 4 the chance of winning! Ah, Miss Jessy. You are SOOOOOOOOOOOOOO talented AND have fantastic ideas like this blog hop! I have had such a GREAT time seeing all of these lovely blogs. Thank you, friend! :) Hugs! Love your prizes and your blog! Thanks for the chance to win. whew! I have spent a good part of my day blog hopping! Yes I did take an easy day today. =) Love both of your green RAKs too! I would to love to participate in the future if you decide to organize another! Did I mention I love your layouts? Yes, I'm a fan & would love to see your *new* pink typewriter! Happy Monday! Hello, already a follower on instagram & now on your blog! Thanks for the chance to win! Been loving looking at all these new blogs!